This investigation will help students discover that hourly shadows always point in the same direction (north), move clockwise, and change length. Students begin to grasp what happens as locations on earth move into and out of the sun's light each day. This lays the groundwork for making sense of the Mystery Class sunrise/sunset clues and for understanding how longitude and time are related. Involve students in choosing an area in the schoolyard or playground that gets a lot of sunlight. Options: Instead of measuring a stick's shadow, students can also use a flag pole, fence post, or other vertical object with a clear area to the north. Data Sheets: Students use these to document hourly measurements and observations. They can make their own or use this printable version. Consider setting up a mock flagpole in the classroom, by sticking a pencil in a spool, for instance. Shine a flashlight at it from directly above and then move the light down so it hits the “pole” at an angle. Ask, What happens to the shadow? What do you think causes it to get longer and shorter? How would you explain them? What general statement(s) could you make about shadows and sunlight? Students should find that shadows always point north of the sun. (In this hemisphere, the sun always appears to the south.) They may also discover that shadows seem to move clockwise in a semi-circle and that they are shortest at noon when the sun appears “highest” in the sky. Shadows are longest in the early morning and late afternoon/early evening when the sun appears low in the sky. As the Earth rotates on its axis, the sun hits each location in the morning at an angle. This becomes more vertical as the sun appears to pass more directly overhead around noon. (It’s actually the Earth that is “passing” as it rotates!) As Earth continues to spin toward sunset, the increasing angle causes shadows to lengthen! 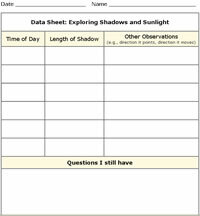 Assess the degree and accuracy to which students are able to justify their explanations of the changes in shadows in relationship to the sun's daily position. Draw a tree and a sun on a reproducible response sheet. Write in several different times of day. Ask students to draw approximately where they think the tree's shadow will fall at each time indicated. Also see these assessment tasks.